The Urban Agriculture Incentive Zones Act (AB 551) is based on a simple premise: It allows cities and counties to designate “incentive zones” in urban areas (250,000+ people) where landowners can get a substantial property tax break in exchange for dedicating their vacant land to commercial or noncommercial agricultural use for at least five years. Under this arrangement, property taxes are based on an assessment of the agricultural value of the land, instead of its much higher market value. 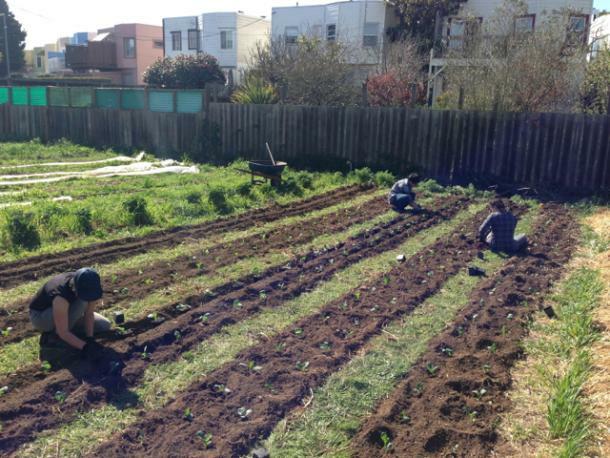 The goal is to financially reward owners of undeveloped parcels for entering into agreements with urban farmers. “For businesses like ours, the potential for having a much longer-term arrangement with a property owner could completely change the playing field,” says Galloway. 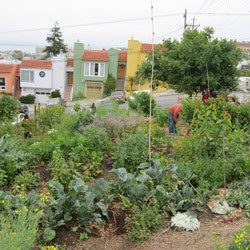 The seeds were planted when Assemblymember Phil Ting (D-San Francisco) reached out to the San Francisco Urban Agriculture Alliance (SFUAA) for ideas on how to promote urban agriculture at the state level. A team of urban agtivists, including representatives from Little City Gardens, SPUR, and others, pitched several ideas. The one that stuck was presented by Stanford Law School graduates Nicholas Reed and Juan Carlos Cancino of the Greenhouse Project. “We came to the realization that even when the ordinances that prohibit the sale of produce grown locally are repealed, there’s a still a fundamental barrier for urban farmers: property tax,” says Reed. They proposed legislation modeled on the California Land Conservation Act of 1965 (also known as the Williamson Act), which enables local governments to offer tax incentives to rural landowners. Photo: University Mound Nursery photo by MattyMatt/Flickr. According to Cancino, the concept was inspired by Little City Gardens as well as University Mound Nursery in the Portola District—two acres of greenhouses that were once home to the Garibaldi family’s rose business but have been abandoned since the early 1990s. 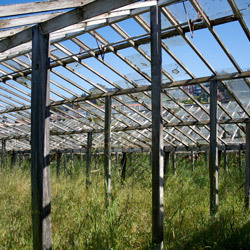 Cancino and Reed have hopes of reactivating the greenhouses for community use, but they have had difficulty engaging the owners. “We thought about this tax incentive as a way to reopen that conversation,” says Cancino. The proposed tax incentive would be a blessing for Aaron Roland, who owns a 5,000-square-foot vacant parcel at 18th and Rhode Island in Potrero Hill. For many years, he grew cantaloupes, tomatoes, corn, and other crops on the sunny plot, but after he moved to the Mission, it became harder to tend the land himself. In 2008, he granted Permaculture designers Kevin Bayuk and David Cody access to the property, which is now a thriving educational garden. As an owner of rural property in Alameda County, Roland was already familiar with the benefits of the Williamson Act and spoke out in support of the new legislation. “I think it’s a good policy move, because it preserves some open space and allows people to do things with it—and it does so without taking property away from the owner forever,” he says. While he cannot afford to develop the property himself right now, he hopes that his children will someday build a home on it. Since the program is voluntary, it remains to be seen how many cities and counties will take advantage of it, but Zigas anticipates that a few governments will introduce their own laws in the coming months. In San Francisco, Mayor Ed Lee and Supervisor David Chiu have already expressed their support, so Zigas is hopeful the city will be among the first. Zigas recognizes that the applications would be limited in San Francisco, where property values are skyrocketing and vacant land is scarce. “I don’t see a huge sea change in parcels popping up out of nowhere,” he says; however, he is excited to see how the law will play out in areas like Los Angeles and Sacramento, where interest has been strong.